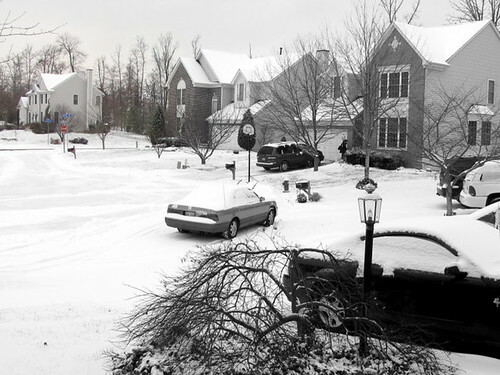 December 2010 ~ I Can Do That! Have you had cold leftover pizza for breakfast? If you do, then why not make individual pizza for breakfast. They're hot and delicious! 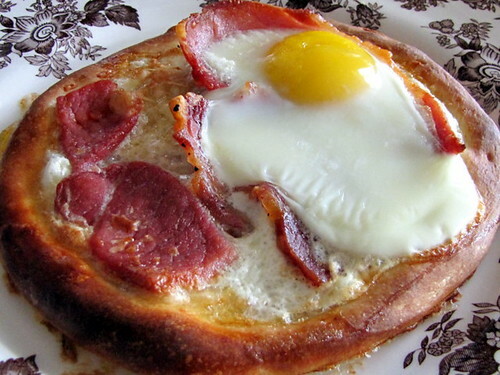 I used my favorite pizza dough from ARTISAN BREADS EVERY DAY by Peter Reinhart and topped them with country ham and eggs. You can top the pizza with sliced and cooked breakfast sausage or half-cooked strips of bacon. Put the egg/s in the middle surrounded by the meat to prevent the whites from running all over. Then bake at 500°F oven on a hot stone or on top of a preheated inverted cookie pan until dark brown on the edges, about 10 to 12 minutes. I got a bit lazy to type the recipe but you can read it at Peter Reinhart's Pizza Quest website. It's a great website for pizza enthusiasts. It has Peter's stories, recipes, and videos on everything pizza. Enjoy! Roasted and candied chestnuts are my all-time favorites during Christmas season. 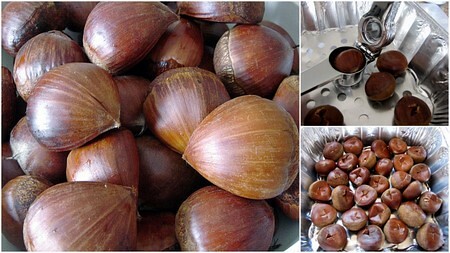 I specially love the aroma of roasting chestnuts. And when I have the time I candy (marrons glacés) some of them which are a real treat...sooo delicious. 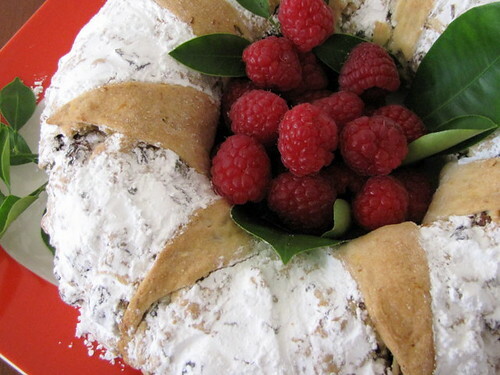 The December KCC theme is Homemade Food Gifts and our hosts are Joy and Maribel. Thank you ladies. The easiest and most convenient for me would be either baked goods or candies and desserts. 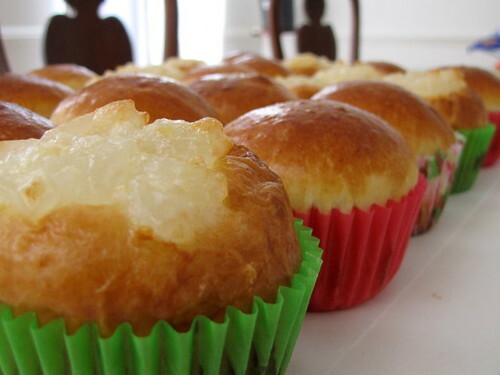 I chose to bake pan de leche (milk bread) and filled half of the dough balls with yema made with caramelized condensed milk and egg yolks and the other half I topped with chopped macapuno preserves. I didn't like any of the recipes I found online and adapted the pain au lait (milk bread) from ADVANCED BREAD AND PASTRY by Michel Suas. 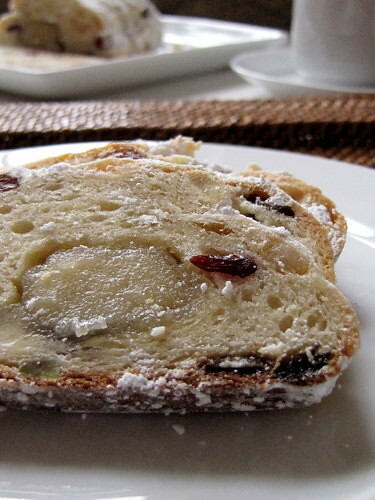 They are basically the same milk bread but Michel Suas' recipe has less sugar and eggs and the dough requires an overnight refrigeration producing delicious, soft, milky, and not too sweet [even with the addition of 1 more tablespoon of sugar]. 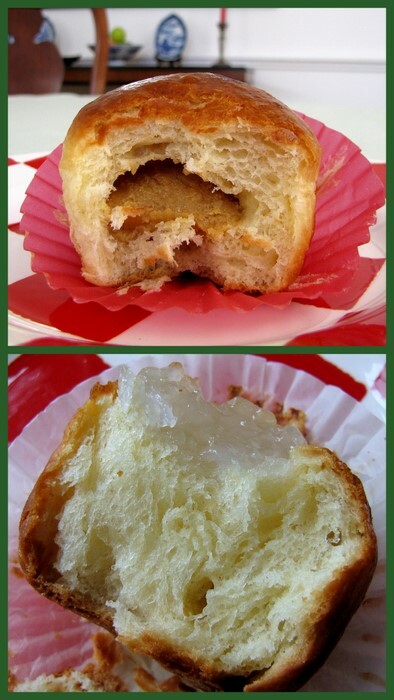 They are perfect little rolls in a gift box that I believe anyone would love for breakfast on Christmas morning. In the bowl of a standing mixer with the dough hook attached, mix all the ingredients except egg wash on first speed for 5 minutes. Increase to second speed and mix for 8 minutes. Transfer dough into a container, cover with plastic wrap and leave on the kitchen counter for 1 hour. Refrigerate overnight. Remove dough from refrigerator and scale into 1½ ounce pieces, shape into balls, cover lightly, and let rest for 15 minutes. Flatten each ball and fill with half a tablespoon of preferred filling. Gather the edges and pinch to close. 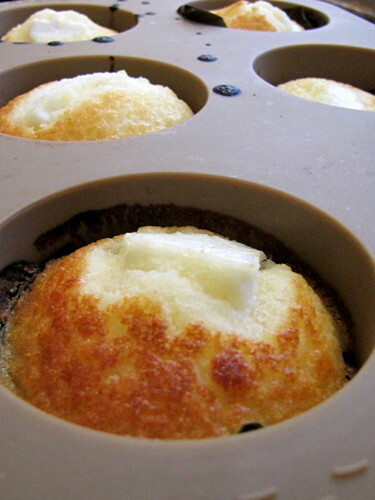 Place each filled ball seam-side down on paper-lined cupcake pans . Cover with plastic wrap and let rise for 1 hour to 1½ hours. 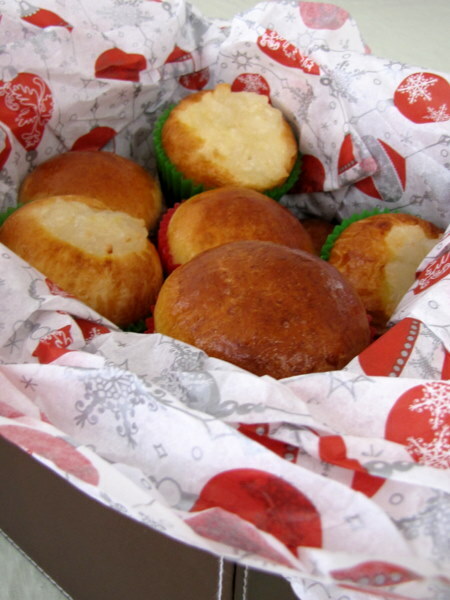 Bake in a preheated 350°F oven for 20 to 25 minutes or until tops of the rolls are golden brown. These are best eaten while still warm. Rewarm leftover rolls in a preheated 325°F oven for 5 to 8 minutes. Thank you Jenn and Jill for choosing this wonderful challenge. 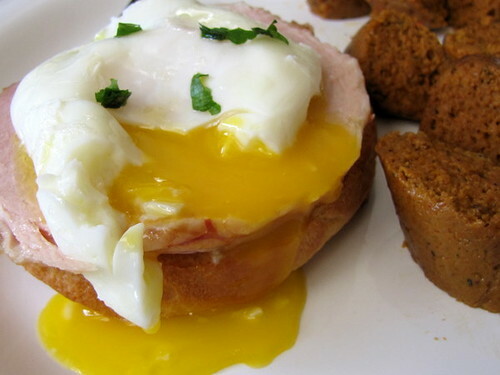 I love eggs, specially fried sunny-side-up with runny yolks. I also like poached eggs but it's too much work and I tend to lose a lot of the whites during cooking resulting in a much smaller egg which means less protein. For this challenge, I poached just one egg according to the recipe and the smallish egg reminded me why I bought an egg-poaching pan many years ago which has an insert [with several nonstick cups] that sits on the simmering water in the pan without the eggs touching the water. This way you cook perfectly poached eggs with all the whites intact. Well anyway, I had the egg on top of a toasted thick slice of brioche and a slice of home cured pork belly ham but did not top it with hollandaise sauce. I sprinkled the egg with sea salt and chopped Italian parsley and had it with slices of the yummy seitan sausage. My sausages are not perfect because they're a bit soft rather than chewy which is how I like seitan sausages but the flavor is fantastic. I'll make them again and will use less liquid; I'm also inspired and will be making Spanish seitan chorizos later this week. Place 6 cups of stock, the garlic cloves, and the bay leaves in a deep sauté pan or stock pot. Heat on medium. In a food processor finely mince the toasted pine nuts, red onion, chili, and sun-dried tomatoes. Add the vital wheat gluten, dried thyme and paprika to the pine nut mixture and process till combined. In a measuring bowl, whisk the stock with the tomato paste and olive oil. Slowly add to the vital wheat gluten mixture and pulse until you have a smooth dough. You probably will not need all the liquid. Start with ¾ cups of the liquid and add more if needed. Whatever liquid you have left can be added to the poaching liquid. 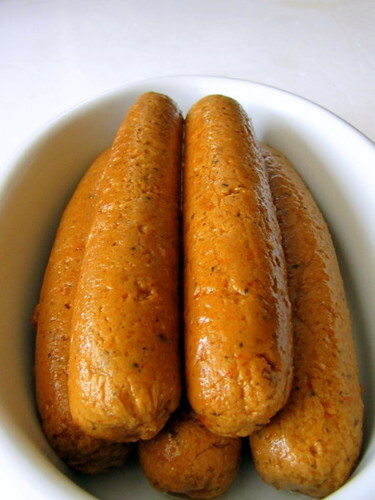 Divide the dough into 10 portions and shape into 6-inch sausages. Wrap each section tightly in cheesecloth and tie off the ends with twine. If the poaching liquid is not yet boiling, turn up the heat until it does. Add the sausages and turn the heat down to a simmer. Simmer gently for 45–50 minutes, or until the sausages are firm. Remove the sausages from the poaching liquid (reserve the liquid if you don’t plan on eating all the sausages immediately). Allow the sausages to cool a little and gently unwrap. These may be refrigerated in their poaching liquid for a week. I'm a bit Christmas-y lately and baked shortbread cookies adding two of my favorite Christmas goodie ingredients, candied cherries and golden raisins. 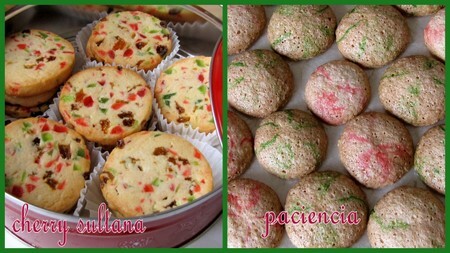 I baked the paciencia with red and green swirls, the recipe will be on a future post. 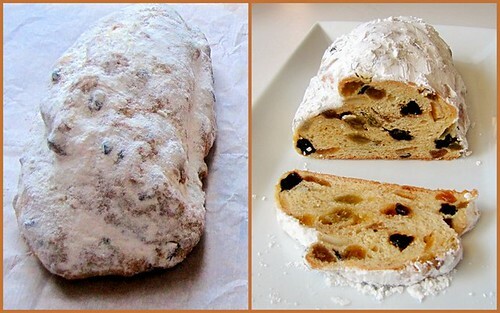 Soak sultanas in brandy for 1 hour. 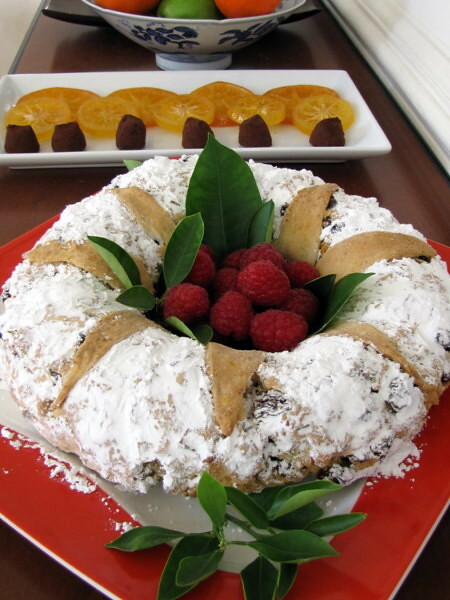 Drain, reserving the brandy, then toss them in 1 tablespoon of the flour. Set aside. Whisk together the rest of the flour, tapioca flour, and salt. In the bowl of a stand mixer with the paddle attachment, beat butter on medium speed until softened. Gradually add sugar and beat on medium-high until fluffy. Add milk and reserved cherry brandy and beat on low for 1 minute. Increase speed to medium and beat until smooth. Add the flour mixture and beat on low until well incorporated. 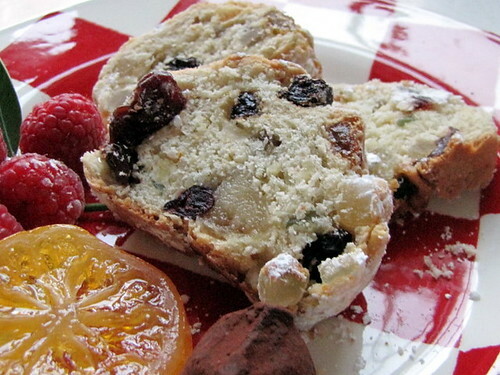 Stir in cherries and golden raisins. Shape into two 9 inch-long logs. Wrap in plastic wrap and chill in the refrigerator for at least 2 hours. Preheat oven to 375°F. Cut the logs into ¼ inch-thick slices. Place on ungreased cookie sheets 1 inch apart and bake for 12 minutes or until the edges are nicely browned. Remove from baking sheets and let cookies cool on wire racks. Store in airtight containers. Bibingka, a Philippine rice cake, baked with slices of native white cheese and salted duck eggs is an all-time Filipino favorite merienda (snack) specially the ones from Ferino's and Via Mare restaurants. 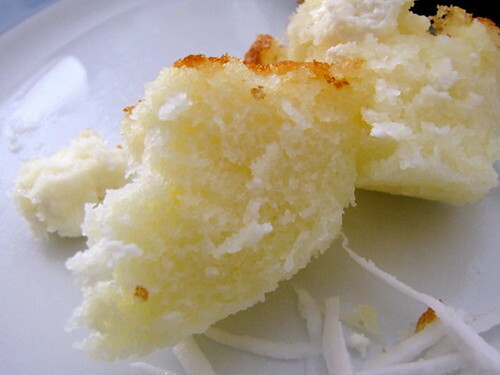 I remember them so soft, fluffy, and buttery and topped with more butter, a sprinkling of sugar, and freshly grated coconut. These 8-inch cakes are baked on top of small clay ovens filled with live coals and the top of the clay oven is covered with an iron sheet filled with more live coals. It takes just a few minutes to bake them. The cakes can be baked in regular ovens but I find the toaster oven on a very high heat does an excellent job similar to the clay ovens. A package of store-bought bibingka mix has been waiting for a few weeks now for my attention. I have always made bibingka from scratch with rice flour but sometimes I get lazy and want to have them right away. The thing is, there's really not much difference with the flavor and the amount of time I spent mixing because the packaged bibingka has only baking powder and salt added to the rice flour and maybe preservatives or anti-caking agents and nothing else. 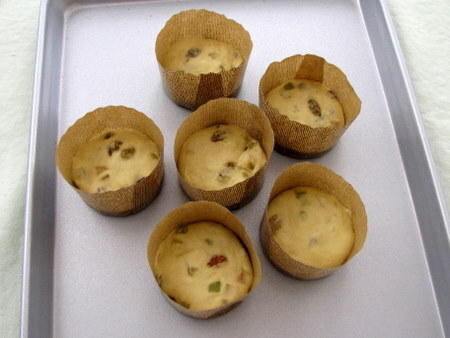 I baked half of the mix in muffin cups and the rest in small molds, all lined with cut banana leaves. I didn't have salted duck eggs and topped the muffins with small pieces of kesong puti (farmer's white cheese) which you can substitute with Indian paneer or well-drained and salted cottage cheese. You can also use mild white cheddar cheese or better yet, make some kesong puti. Heck, you can even top the bibingka with chocolate chips, Nutella, or salted caramel and they will still be soft and fluffy and will taste heavenly. 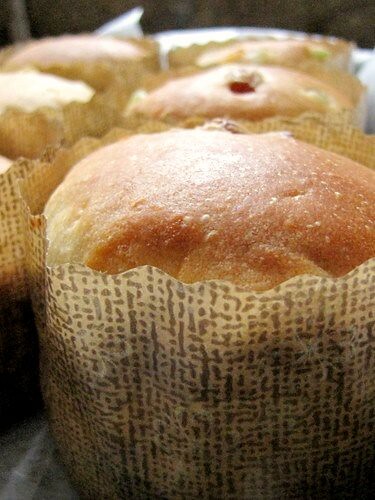 Line muffin cups with banana leaves. In a medium bowl, mix all the ingredients, except cheese, grated coconut, and optional butter and sugar, until well incorporated. 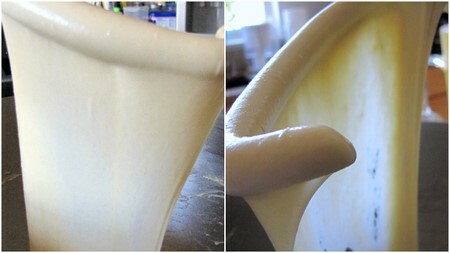 Batter should be runny; add more milk to adjust consistency. Fill the cups half-full. Top with 2 pieces of cheese and bake for 12 to 15 minutes or until tops are golden brown. Spread some butter and sprinkle sugar on top, if desired. 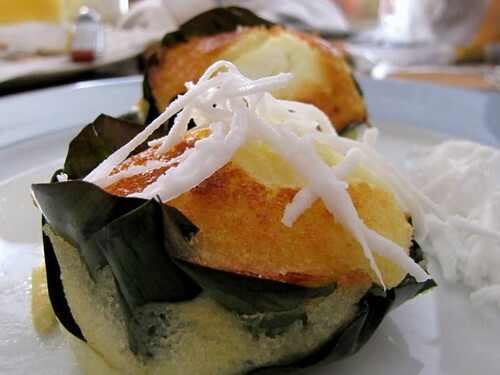 Top with grated coconut. In a small bowl, beat the egg yolks and the 3 tablespoons sugar until thick. In a small pan, heat the half and half and nutmeg to just boiling. Temper the egg yolks: with the beater on medium-low speed, slowly pour about a cup of the hot half and half mixture until thoroughly mixed. Pour the tempered yolks back into the pan, stir to mix. 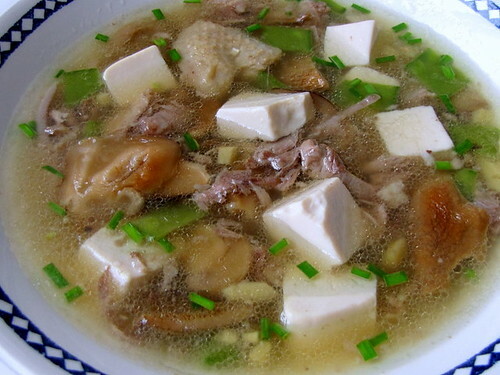 Cook on medium-low heat until mixture reaches 160°F. Stir in the bourbon, rum, and brandy. Transfer into a measuring cup, cover with plastic, and chill for at least 6 hours or overnight. Beat the egg whites to soft peaks, add the half tablespoon of sugar and beat until stiff. Whisk the egg whites into the chilled mixture. 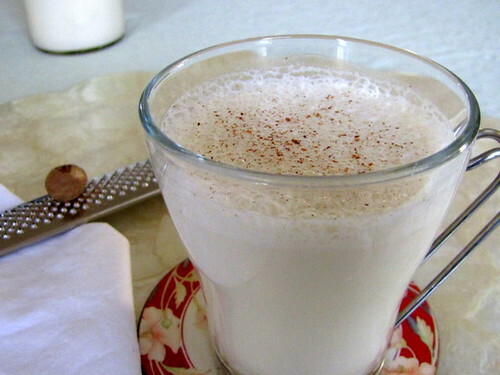 Serve each glass with freshly grated nutmeg.